Newspaper article about the inauguration of President Johnson following the death of President Lincoln. On the morning of the 15th, Stanton made known to Andrew Johnson that the death of the President devolved the duties of the Presidential office upon him; that it was necessary that he should be inaugurated as soon as possible, and wished to know the time and place for taking the oath of office. Johnson designated his private rooms at the Kirkwood House that day at eleven o'clock, A.M. At the appointed hour, Chief Justice Chase accompanied by the Heads of Departments and other distinguished dignitaries repaired to the designated rooms and administered the required oath of office. After the oath was administered Johnson said, the duties of the office are mine, I will perform them, the consequences are with God; gentleman I will lean upon you. I feel that I shall need your support, I am deeply impressed with the solemnity of the duties of the office I am assuming. Stanton reports April 15th, 3 P.M., that the new President met the heads of Departments that day in council, provided for the funeral of the late President, appointed Wm. 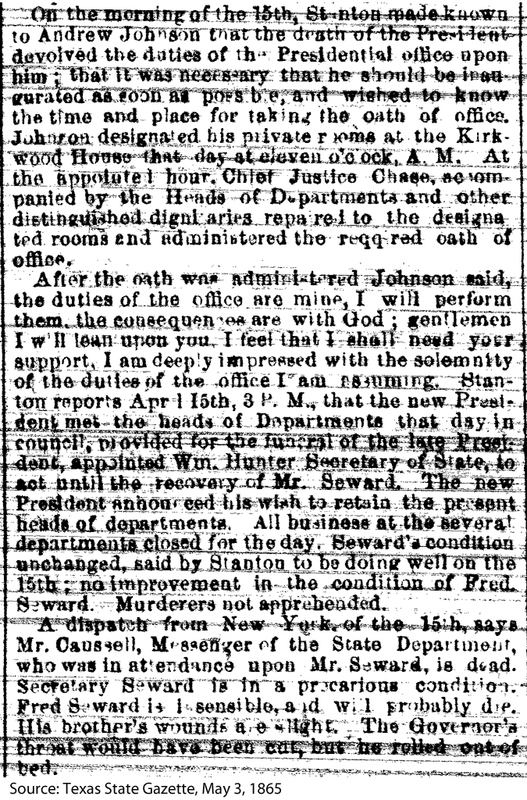 Hunter Secretary of State, to act until the recovery of Mr. Seward. The new President announced his wish to retain the present heads of departments. All business at the several departments closed for the day, Seward's condition unchanged, said by Stanton to be doing well on the 15th; no improvement in the condition of Fred Seward. Murderers no apprehended. A dispatch from New York, of the 15th, says Mr. Caussell, Messenger of the State Department, who was in attendance upon Mr. Seward, is dead. Secretary Seward is in precarious condition. Fred Seward is [illegible], and will probably die. His brother's wounds are light. The Governor's throat would have been cut, but he rolled out of bed. Use of this item for research, teaching and private study is permitted with proper citation and attribution. Reproduction of this item for publication, broadcast or commercial use requires written permission. 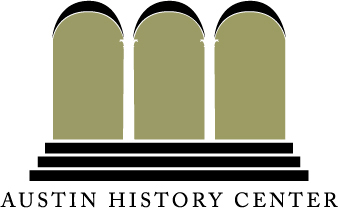 For permission, please contact The Austin History Center. For reproduction information please visit this page.